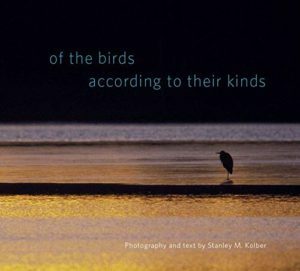 On Thursday, Feb. 7, at 6:30 p.m., the Old Lyme-Phoebe Griffin Noyes (OL-PGN) Library hosts an Author Talk and Book Signing with Stanley M. Kolber, author of, of the birds according to their kinds. Kolber lives locally and the review of his highly acclaimed book on Amazon.com states, “With artistically rendered photographs and engaging prose, of the birds according to their kinds brings the reader into an avian world throbbing with life, overflowing with beauty. It is a book you will pick up again and again, a companion for moments of reflection and repose. Not a field guide, not a treatise, it shows one path to greater respect for these birds – to gratitude that, living their lives among us, they are a source of abiding wonder. At this event, learn what inspired Kolber’s amazing photos. Kolber has shared his love of birds, nature and photography by running workshops at the Connecticut River Museum in Essex. He has exhibited his photographs in New York’s Salmagundi Club and in Connecticut’s Mystic Museum of Art. Among the highlights of the book are photos he captured while working at his favorite locations here in Southeastern Connecticut, and nearby coastal Rhode Island. The event will be held in the OL-PGN Library Community Room. All are welcome and admission is free. Registration would be appreciated at this link since it allows the library a means of contacting people if there are any changes to the program due to weather, etc. For more information, visit the library at http://www.oldlyme.lioninc.org or call 869-434-1684.